In the forested mountains 250 miles south of Brownsville, El Cielo is a birders’ paradise. In the tropical cloud forest called El Cielo, in the tiny Mexican village of Alta Cima, the women embroider souvenir wall hangings of the magnificent birds to be seen there. One depiction of a leaf-bare tree adorned like a Christmas tree with candy-colored birds seemed fanciful to me. In nature, I mused, no one would see so many colorful and varied birds in one tree at one time. But I jumped to this conclusion before I had been birdwatching in El Cielo, the northern-most cloud forest in Mexico. The next day, I spent rapturous times scanning a bare pecan tree in an open field in Alta Cima. At one moment it held a Couch’s kingbird, a blue-headed vireo, a clay-colored robin and a yellow-winged tanager. The embroiderer had not exaggerated by much. Some of the birds I saw that day, such as the Couch’s kingbird, the green jay and a few of the warblers and orioles, would be familiar to South Texas birders. But many of the others, such as the domesticated crested guan hanging around the chicken yard; the melodious blackbird (yes, it sings); the bat falcon, named for its favorite prey; the squirrel cuckoo, named for its long tail; the blue mockingbird, the bronze-winged woodpecker, the ornate hawk-eagle and many of the eye-popping tanagers typically come no farther north than here, 250 miles south of the tip of Texas. Situated at the crux of four major ecosystems in the Mexican state of Tamaulipas, El Cielo has been declared an international biosphere reserve, and its 356,000 acres of forested mountains are protected by Mexican and international law. For the past 50 years, American as well as Mexican naturalists have been visiting El Cielo, and gradually a small ecotourism business has been building in this remote area, home to some of the last wild jaguars in Mexico. For bird-watchers and nature lovers, El Cielo is a destination spot, the closest and most affordable place to Texas in which to view the birds of a cloud forest. And even though parts of El Cielo are difficult to get to, the cozy mountain town of Gómez Far�as can be reached easily from the Valley by driving south for only about six hours, mostly on smooth, lightly traveled, four-lane highways. In the dry thornscrub south of the Mexican city of Ciudad Victoria, capital of the state of Tamaulipas, a brightly painted roadside sphere marks the passage of the Tropic of Cancer. The difference between South Texas birding and the cloud forest, says one of my trip mates, Steve Labuda, is frost. A federal wildlife manager from Brownsville, Labuda has been coming to El Cielo for more than 20 years. On the way to El Cielo, we were walking in a lowland tropical forest watching birds and butterflies, when four brown jays burst out of the brush, flushing a spray of insects. The insect buffet is complemented by the flowering and fruit-bearing plants, enabling the cloud forest to support tribes of hummingbirds, parrots, warblers, flycatchers and gnatcatchers, quail, cuckoos, warblers, thrashers, buntings and tanagers. 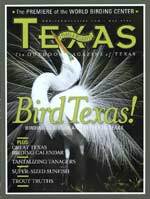 A checklist for the area researched and written by John Arvin, formerly with TPWD and now with the Gulf Coast Bird Observatory, totals nearly 400 birds. As a newcomer to tropical birding, I was glad to be with Labuda, who was part of a group that toured El Cielo in October 2003 under the sponsorship of the Mexican government. The government’s concern is how to improve the tourism in this fragile and biologically diverse region without harming it. The strategy involves the use of small tourism companies and individual guides. Labuda and several other guides who are listed with the McAllen Convention and Visitors Bureau conduct tours to El Cielo, meeting visitors at the border and driving them to the interior. Mexican guides are also available to pick up birders in Ciudad Victoria. Or visitors can drive to Gómez Far�as, which has two charming, small hotels, and enlist the help of local guides to see birds in the higher elevations of Alta Cima and San Jose. El Cielo was heavily lumbered during the 1960s, and some of the junk of that industry is still rusting in the forested highlands of San Jose. But the region’s rough terrain and inaccessibility led to the decline of lumbering. In 1985, Mexico, working with the United Nations, established the El Cielo Biosphere Reserve, preserving it for the use of low-impact recreationists and study by scientists. American scientists began studying the area in earnest in the late 1940s. For the last 40 years, scientists and students from the University of Texas Southmost College in Brownsville have worked at a remote research station in the upper altitudes. Fred and Marie S. Webster have written an account of these efforts in the book, The Road to El Cielo, published by the University of Texas Press. Mexican scientists are hard at work in the cloud forest, too, and a growing awareness of the value of ecotourism is taking root in Mexico. One of the first steps has been to develop a birdwatching culture in Mexico, says Hector Gómez, one of Mexico’s leading guides. The son of a United Nations translator, Gómez grew up in New York, where he learned fluent English, and in Kenya, where he fell in love with birds. Gómez is working to improve the state of Mexican birdwatching guidebooks. (The two most useful are Roger Tory Peterson’s Field Guide to Mexican Birds and Ernest Preston Edwards’ A Field Guide to the Birds of Mexico and Adjacent Areas (UT Press). He has also been training native guides in Alta Cima, so some of the tourism money will go directly into this village of 180 people. A couple of local guides have established a reputation, says Gómez, and they are becoming well respected. One is Ricardo Jimenez of Gómez Far�as. A second, from Alta Cima, is Esteban Berrones. When Gómez began a recruiting program several years ago, he found that Berrones was a natural. Although he didn’t know their names, he had taught himself to identify many of the birds in his village by sound alone. His English is coming along, and he has a perpetual smile on his face, the smile of a man who is happy with his place on earth. Berrones was scheduled to be one of several speakers at the four-day-long Birding Festival Victoria, held in February. For less than $500 a person, the festival offered ground transportation to the area from the Valley, three nights accommodation, all meals, guided birding tours and lectures. This bargain-priced birding was even cheaper for those who were willing to share accommodations. Getting to the village of Alta Cima from Gómez Far�as takes takes drivers up a steep rocky road that requires a high-clearance vehicle. In recent years the men of the village have built and maintained a cinder-block motel, plastered and painted mustard yellow, with running water, some hot showers, and fluorescent lights run by solar panels. The accommodations might be too rough for some tastes, but the rooms are inexpensive and come with plenty of instant coffee and rolls in the morning. The village restaurant serves simple but delicious meals, including breakfasts of huevos rancheros along with granola and yogurt. But most importantly, this hotel stands at the foot of an amazing birding area, so your time is all about walking while birding. For someone who wants to get away from it all and wake up in the cloud forest, this is the place. There are plenty of hikes and places to visit. The plants, butterflies and waterfalls are all part of the birdwatching as well. An hour-and-a-half walk farther up is the town of San Jose, which offers pine forests and birds that prefer higher elevation. It has rained too much to take this trip to the higher elevation and another suite of species, but I am happy to be in Alta Cima, at about 2,700 feet above sea level, the place with the most birds. I wake up at dawn and sit on the porch of the casita, listening to chachalacas call and watching clouds roll through the valley below me. All night long it has rained, making a wonderful racket on the metal roof. From the porch I look over a broad green field. A tall pine is draped with Spanish moss. The mosquitoes are fierce, and I am glad to have plenty of repellant. I drink instant coffee and eat Mexican pastry and a banana and watch the clouds move through the valley. These are the clouds that give this place its name and nurture the ferns, begonias, orchids and many other epiphytes that grow from its wet cliff sides. And this entire habitat supports food and shelter for birds. During the walk to the center of the village, a common raven flies over. A canyon wren calls from a rock pinnacle, and we spot it above a patch of orange lichen, singing its heart out. Hector Gómez pauses at the call of the rufous-browed peppershrike. Thunder echoes through the valleys and we tread cautiously along the slippery parts of the trail. There goes an Empidonax flycatcher, almost impossible to see. In the huisache, Steve Labuda spots a black-throated green warbler. He has been out before first light, hoping to hear the call of the Tamaulipas pygmy owl, a specialty of the cloud forest. By the time we reach the restaurant, the rains are heavy again, and there is nothing to do but sit it out for a while. But just as the birders seek shelter, so do the birds. When the rain relents, both birds and birders come out. These can be some of the best moments for birding, says Labuda.